Hard on the heels of legendary multi-platinum selling rock band KISS' Reunion tours, spanning 400 plus shows from 1996 through to 2001, founding guitarist Ace Frehley began labouring over the material that would culminate in the 2009 release of 'Anomaly', his fifth solo studio album. 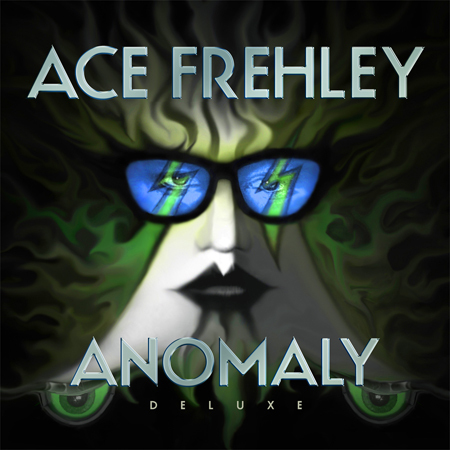 'Anomaly, which became the highest charting Frehley solo album since his self-titled debut in 1978, when it crashed in to the US Top 100 album chart at 27, received a more than welcoming response from critics. Rolling Stone proclaimed "'Anomaly' shows why many rock and metal guitarists list 'Space Ace' as a prime six-string influence", while Allmusic.com stated that "'Anomaly' surprised even longtime supporters with its forceful, confident performances and sharp songwriting." Out of print since 2010, 'Anomaly Deluxe' has been newly remastered and contains 3 bonus songs, including 2 previously unreleased tracks, along with one for the first time on CD. Bonus tracks are; 'Hard For Me' (previously unreleased), 'Pain In The Neck' (previously unreleased slower version) and 'The Return Of Space Bear' (for the first time on CD). 'Anomaly' will be released as a DigiPak CD and (1,000 Limited Edition) double vinyl Picture Disc LP in a clear sleeve with leaflet, plus download and stream, on September 8th on Steamhammer / SPV. Ace Frehley is arguably the most popular original KISS band member, having enjoyed the best-selling solo album career (vintage or current) of the original foursome - let alone the only Top 40 single, 'New York Groove', (from the 'Ace Frehley' album), which peaked at #13 in Billboard's top 100 singles chart. 'Anomaly's follow-up, 'Space Invader', became the first ever Top 10 Billboard 200 debut of any Kiss related solo album when released in August 2014, the same year that he was inducted into the Rock and Roll Hall of Fame. 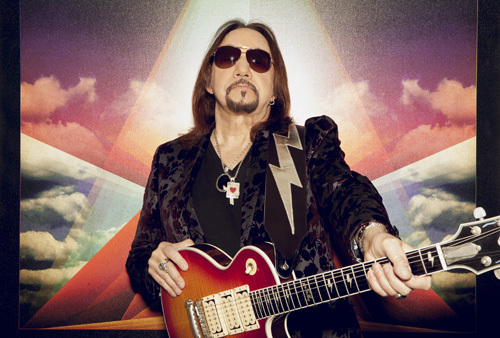 Rock and Roll Hall of Famer Ace Frehley is set to release 'Origins Vol. 1', an accomplished covers album featuring some of the biggest names in rock and roll, on April 15, 2016 on Steamhammer / SPV, as a digipak CD, double vinyl LP and download. Most notably, KISS front man Paul Stanley joins Ace on Free's hit 'Fire and Water'. This collaboration marks the first time that Ace and Paul appear on the same recording since KISS's 1998 reunion album 'Psycho Circus'. Other illustrious guests include none other than Slash trading leads on Thin Lizzy's classic 'Emerald', Lita Ford singing and playing lead on The Troggs' staple 'Wild Thing', Rob Zombie guitarist John 5 playing guitar on the KISS song 'Parasite' and Jimi Hendrix's 'Spanish Castle Magic', plus Pearl Jam's Mike McCreedy playing guitar on Ace's mainstay 'Cold Gin'. 2014 Rock and Roll Hall of Fame inductee Ace Frehley has signed to Steamhammer / SPV to release his first solo album in five years, ‘Space Invader’, containing 11 brand new original songs, plus a cover of Steve Miller’s ‘The Joker’, on August 16th. ‘Space Invader’, the cover of which was painted by Ken Kelly, the famous creator of KISS’ ‘Destroyer’ and ‘Love Gun’ albums artwork, will be available as a limited edition Digipak CD, (including 2 bonus tracks and poster) as well as a standard jewel case CD. ‘Space Invader’ will also be released as a double gatefold coloured vinyl album, boasting 4 bonus tracks, printed inner sleeves, and a CD in a cardboard sleeve, while the iTunes version of ‘Space Invader’ will include the 14 tracks contained on the digipak. Widely known as the original ‘Space Ace’ and founding guitarist for 16 cumulative years (over 2 tenures) of multi platinum selling rock band KISS, Frehley is demonstrably the most popular original member, having enjoyed the best selling solo album career (vintage or current) of the original foursome. Frehley’s self titled solo debut ‘Ace Frehley’ album, which was released in 1978, went on to sell well over one million copies, and produced the only Top 40 single, ‘New York Groove’, to be taken from any of the legendary KISS band members’ solo albums to date. ‘New York Groove’, which peaked at #13 in Billboard’s top 100 singles chart, was most recently featured in an episode of cult show ‘Entourage’ and was also KISS’ second bestselling download in 2012, besting such KISS Army anthems as ‘I Was Made For Lovin’ You’ ‘Beth’ and ‘Calling Dr. Love’ - even after 36 years. After his departure from KISS, Ace went on to release four more solo albums and one live EP, culminating with his most recent opus, ‘Anomaly’ in 2009, which received a more than welcoming response from critics; "‘Anomaly' shows why many rock and metal guitarists list ‘Space Ace’ as a prime six-string influence," proclaimed Rolling Stone. ‘Rolling In Town’, an infectious, joyous collection of dynamic ‘old school’ classic bluesy hard rock anthems, will be released as a CD, Clear Vinyl LP (with printed inner sleeves and CD in a paper sleeve) and download.